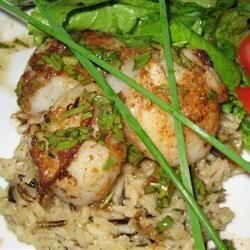 "Lightly browned sea scallops complemented by a smooth brown butter sauce with fresh tarragon. All you fans of tarragon, this is the recipe for you!" Heat 1 tablespoon olive oil and 1/2 tablespoon butter in a large skillet over medium heat. Season scallops with salt and pepper. Place half of the scallops in the skillet without crowding; cook until browned, about 2 to 3 minutes on each side. Remove scallops to a plate. Heat 1 tablespoon olive oil and 1/2 tablespoon butter in the skillet, and cook remaining scallops. Remove to plate. Wipe out skillet, and return skillet to medium heat. Pour in wine, and boil 1 or 2 minutes, until reduced to about 2 tablespoons. Reduce heat to low, and whisk in the remaining 4 tablespoons butter; just softening butter to form a smooth sauce. Stir in salt, lemon zest, and tarragon. Pour sauce over scallops. this was lovely.... served it with orzo to soak up the sauce. next time, i would use little to no olive oil in the pan so it would not be so oily. Lovely! Great Recipe. Easy and very quick to make! I added some garlic to the sauce. Grab some fresh bread to soak up some of the sauce... excellent. This dish was scrumptious. At the end I added some bread crumbs and Parmesan cheese and placed it under the broiler for 1 minute. Wow!